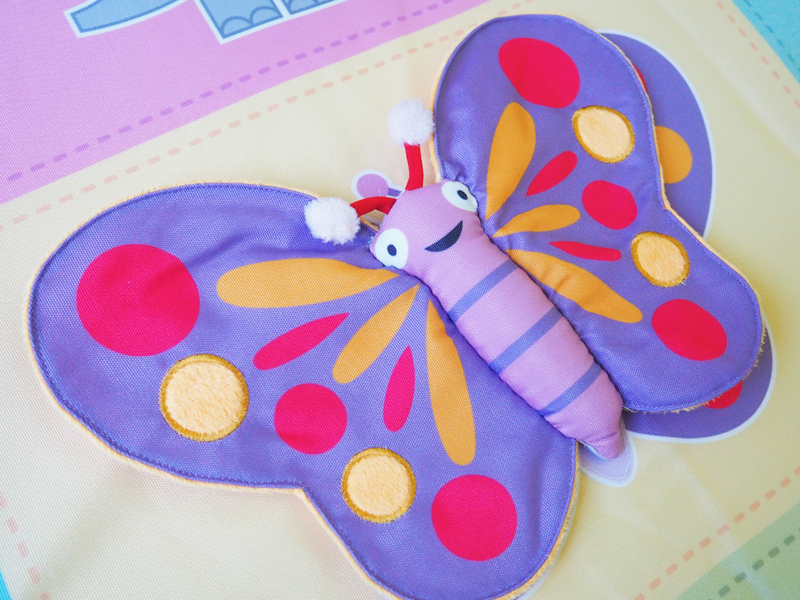 A play mat is one of the items a parent will have on their list of "to buy" for there baby. With so much choice out there it is tricky to choose which to buy for a child. 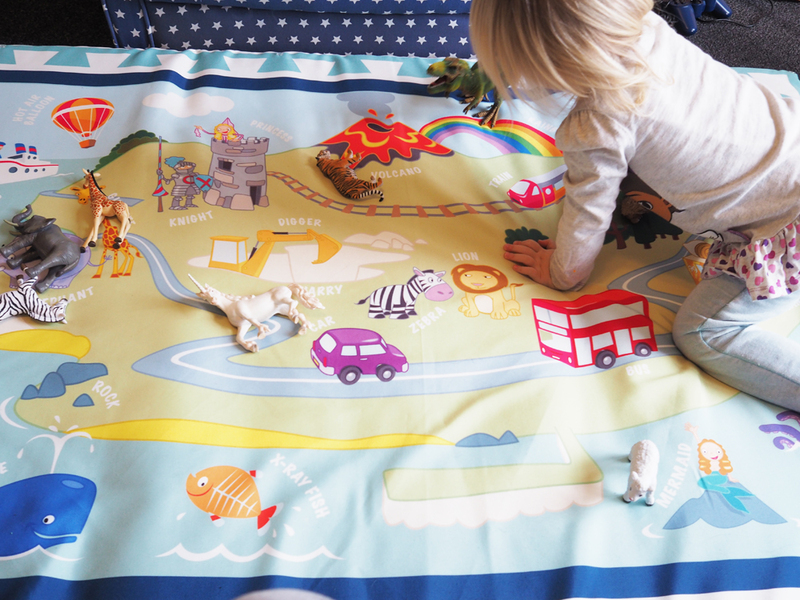 I have a brilliant play mat to tell you all about which is very different and has a lot of positive features about it. I was sent a play mat from JayceeBaby to review. If you are a regular reader of my blog, you may be thinking why would I need a play mat, as you know, I don't have a baby but a 3 year old. So what use would I have for one? 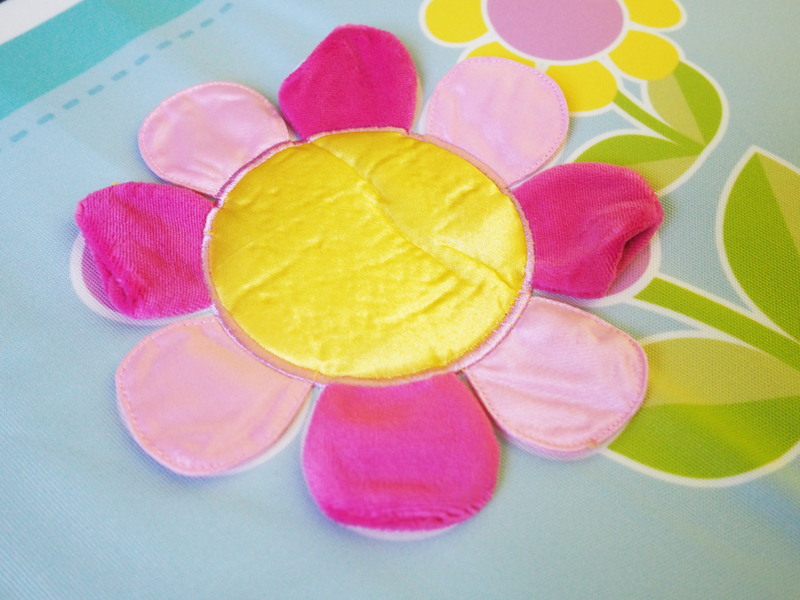 Well the first amazing factor about the JayceeBaby play mat is that it is not just for babies. It has 2 sides to it and has one side which is designed around a toddler/small child. This is a great positive about the play mat as it means that you will get years of use out of it and when you baby has finished using the sensory side, you can flip it over and make use of the other side. 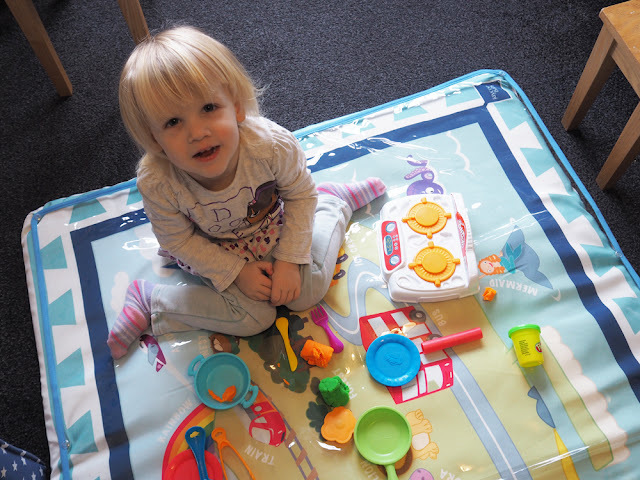 There are so many beneficial reasons to why you would want to use a play mat. Tummy time is really beneficial to strengthen a babies neck and forearm muscles and also relieve the pressure off the back of a babies head. It is recommended that a baby should have tummy time 2-3 times a day for around 5 minutes at a time. Not all babies enjoy this and so the idea of the JayceeBaby mat is to make tummy time more comfortable and enjoyable for the baby. The matt is 5cm thick and made up of layers of foam and so really soft for the baby to lie on. Even I find the mat very comfortable, I could happily sleep on it. This is what makes the matt perfect for tummy time and perfect to go on hard floors as it will not hurt your babies arms or tummy as they lay down. It also reduces the risks of bumped heads as your baby starts to learn to lift their head. As your baby grows it will really encourage your child to move around and roll and is also perfect for when first learning to sit up as you don't have to worry about them falling back and hurting them selves. The design of the baby side has lots that will encourage your baby to want to lay facing the matt. It has a colourful design with animals that all have sensory features such as making crunching sounds, being soft and furry and shinny areas. It also has a mirror which your baby would enjoy looking through. 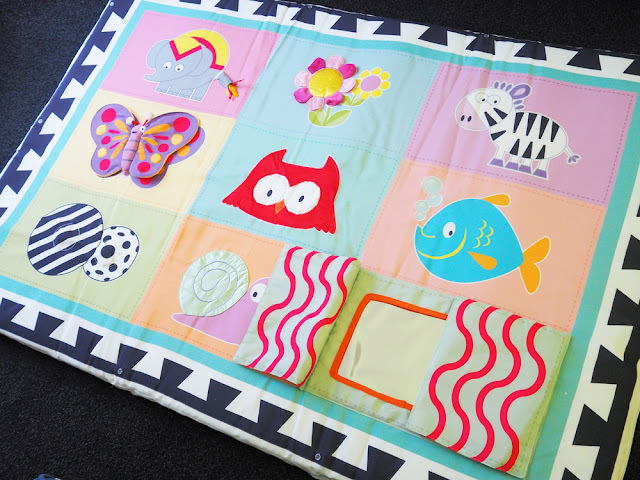 The mat is really large at 100 x 150 cm and so is perfect for a baby to be able to move around or for an adult to lay down next to them and play. I now have carpets in my home but in my last flat I had a hard flooring and so this would have been perfect for our home. I used to put a rug down with a play mat on top, but it was a lot thinner than this play mat and so definitely not as comfortable. On the other side there is a adventure theme picture with animals, vehicles and characters on. It also has words which say which what each picture is. This side is perfect for when your child gets a little older and you can put their toys on for them to play with. Lily really enjoyed getting her toy animals and moving them around the picture. The matt also comes with a plastic sheet which can be placed over the top of it. It is really easy to put on and simply pops on with little plastic press studs around the edge. This is perfect for messy play such as play dough or painting. I would of loved to have had this matt when Lily was a little younger as we did a lot of hand and footprint paintings and so did these on the floor. The matt is easily wipeable and so the perfect way to keep messy play messy but also keeping your floors clean. So far Lily has enjoyed playing with play dough on her mat, though I did find that because she could walk around on the play mat and crawl on it, she kept standing in the play dough or crawling in it and getting it stuck to her. Which then if I wasn't watching, could of got walked into my carpet. But for parent led activities it would be perfect and I think I will try doing some new hand and footprints with her soon. The mats cover can be removed and is machine washable which is helpful and for storage it folds up and has some straps that go around it which also makes it have a handle for carrying. Although the mat does fold up for storage, due to its size I do find it tricky to store as it does take up a lot of room, which is the only down side to the size of the mat. I do have quite large rooms so it fits on the floor when layed out perfectly though wouldn't in all rooms and would be to big to fit in Lily's bedroom. 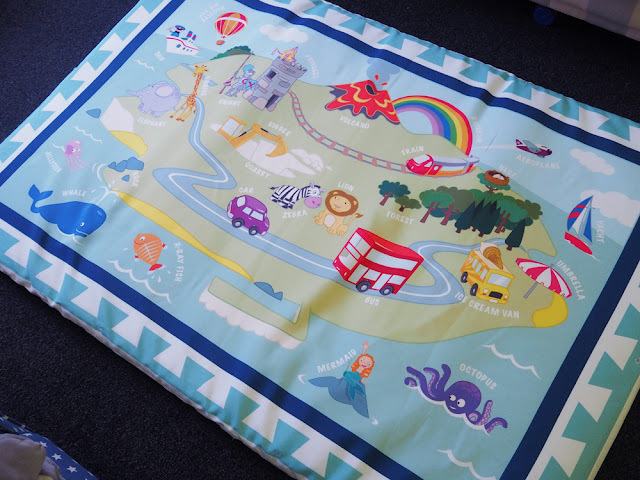 I think this play mat would be perfect for nurseries that have a baby and toddler room as more than one baby could lay on it and they would definitely have the space for it. 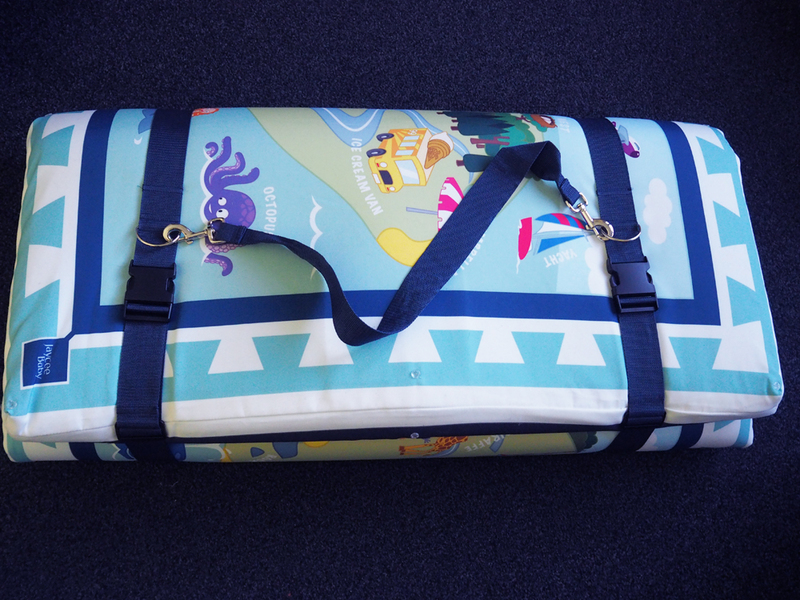 The mat costs £65 and can be bought directly from the JayceeBaby website. What do you like about this mat? Who would love to win one of these mats? Enter below on the Gleam app for your chance to win. Love the practical aspects of double sided, so suitable for a wide age range. Padded, wipe able, has waterproof cover, folds and has a carry handle. These aspect mean that it will meet the needs of families, etc whilst also being durable. Great, as would provide a fun place, for a little one. Seems to provide a Delightful play area for little ones to interact with. Have just suggested this to my sister-in-law for her kids after reading your review. She has two children but about a years difference in age so this would be great for her to be able to use for the oldest one and still get use out of for the younger one. The side with picture of adventure theme picture, as great fun for children. Imaginative play. The adventure theme picture with animals, vehicles and characters on. I like the sensory side, its looks great fun! The sensory side with mirror. Delighted to read this post as I am currently looking for a mat. Thank you. I love the island side, it looks fab! I love the side with picture of adventure theme picture! The adventure theme picture with animals, vehicles and characters is my favourite, thanks. I think both sides are great, just for different aged children. I like the adventure themed side the most! I love the side of the mat with the mermaid on. my favourite! !